In the Autumn of last year we received a small research grant from Making Ways, a new programme supported by Sheffield Culture Consortium through Arts Council England to showcase, celebrate and develop visual art (and craft) produced in the city. For some time we’d been preoccupied with the idea of researching and integrating locally sourced materials into our practice, so we decided to take this opportunity to explore our materials in greater depth, starting with the very stuff beneath our feet - clay. Eighty years on and this estrangement is ever more pronounced. But on the other hand there has been revival in craft, with many makers are following traditional processes and inventing new ones, often working to expose the beauty and integrity of the raw materials they are working with. In the area of South Yorkshire where we live, the clay is earthenware, often used in the brick-making industry. We decided we’d like to work with it, and luckily for us we knew a potter, Nigel Cunis, who is rather knowledgeable on the subject. I grew up a few hundred metres or so from where Nigel works in his pottery, a converted barn adjacent to the 17th Century manor house in which he lives with his wife, Sally, in Silkstone, South Yorkshire. 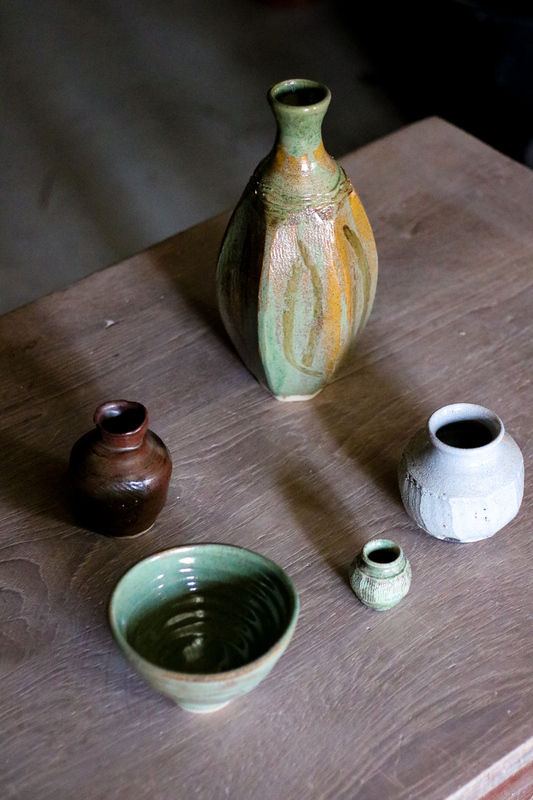 Here Nigel makes pots, both decorative and functional and often using clay from his own land. We contacted Nigel at a rather tricky time for him, twelve months or so after he’d suffered a frustratingly debilitating injury, fracturing and dislocating his shoulder and causing severe nerve palsy. After enduring four operations he was able to work with about 50% use in his arm, but it wasn’t a given that Nigel would ever be able to throw again. In short, a potter’s worst nightmare. Nigel had initiated a personal project entitled the ‘Recovery Pots’ which resulted in some canny new processes for making and experimental ideas, suggesting not only Nigel’s resilience and determination to get back to the wheel, but creative innovation too. Some of the pieces I like the most are from a series of slab built faceted vases with thrown rims, and necks latterly joined to the body of the vase, they’re unusual and beautiful too. But the digging and processing of his clay was very much on hold. So we approached Nigel with a proposal - that we would do the labour of processing home dug clay if he could impart his knowledge. Fortunately for us he said yes. The clay we were working with at Nigel’s had already been dug a couple of years ago and stored in an outhouse. We visited the site where it was sourced, down a wild path of nettles and blackcurrants to the front of the house. It’s old land here with ancient looking trees, a busy thoroughfare for fleeting deer and other wildlife. The process of transforming the earth into workable clay is relatively simple, if not laborious. Firstly we broke up the large pieces of earth into smaller segments in a plasterer’s bath, using a sledge hammer, and then with our hands, making the particles as small as possible. Water was then added to rehydrate the dried-out earth, transforming it into a mustard-yellow mud. We left it like this for a couple of weeks, returning every so often to slake the clay with a rake. Next we sieved the clay. Nigel had designed an effective system to do this, firstly using a regular soil sieve to get rid of any stones, followed by a frame of mosquito net covering the entire plasterer’s bath. This process took perhaps a couple of hours, much quicker than usual I’m told, probably because there were two of us working at it and we brought with us a new tool - a printmaking squeegee. The sieved clay must then be left to dry a little. We did this by placing the wet clay on specially prepared plaster bats which were gently heated from below. On average, the each batch of clay took about three days to dry. At this point the clay is pretty much ready to use, but it still needs a final working to ensure it is fully mixed and free of trapped air. One way to do this is to mix and wedge it by hand, but luckily for us Nigel has a pug-mill - a labour-saving piece of machinery that does all the hard work for you. The idea of doing that bit by hand doesn’t appeal to me much, I must admit! We began the process with approximately 37kg of earth and by the end had 28.5kg of clay. It’s not necessarily a complicated process but it does require space, time and some specialised equipment. It’s a very pure, methodical way of working, but the prize is at the end when you’re left with a material that can be traced to a specific landscape and geology. It’s exciting! During our first visit to his pottery Nigel showed us some fragments of pottery excavated from a site nearby which had once been an industrial hamlet housing a glassworks and later, a pottery. These look like functional pieces, most likely made for local trade. It didn’t take me long online to get more information about the pottery at Silkstone (on the site of the Old Glassworks at Tom Horsefield’s Garden Centre) which seemed to have been active in the late 17th and 18th century. The pottery produced functional ware, “press-moulded dishes with trailed and combed slip decoration, and thrown plates and mugs with manganese mottled decoration”. Few complete pieces survive and are now in the care of local museums, and one at the British Museum too. Silkstone is famous for its coal seams, but the more I read, the more I learn about the dominance of glass and pottery to local industry. 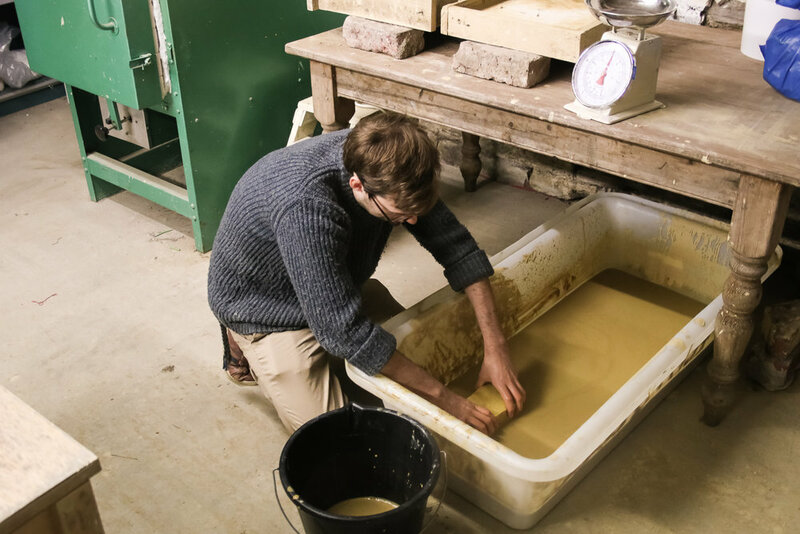 As part of the process Nigel kept back some of the clay, unprocessed, or ‘wild’ as we called it. He’s been throwing tea bowls off the hump on his kick wheel, clockwise, armed with gloves and, indeed, a stroke of wildness - the ‘adventure of being close to the stuff the world is made of’. Nigel at work on his kick wheel, wearing gloves to work with the ‘wild’ clay, and resulting pots which have been thrown ‘off the hump’. Thanks to Nigel and Sally Cunis for hosting us, including your generous lunches, we had a lovely time.